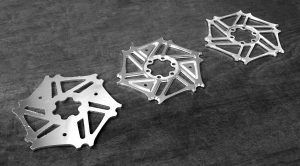 At the Barnoldswick factory of bicycle aftermarket component manufacturer Hope Technology, nearly all parts are machined from aluminium. Due to the relatively light metalcutting involved, it is not surprising that nimble, 30-taper machining centres are found on the shop floor alongside more powerful but relatively ponderous machines having a 40-taper tool interface. Indeed, works and production manager Lindley Pate has started to replace some 40-taper machines with 30-taper technology, although there is no conscious policy to do so. Each machine is purchased on its merits for the intended applications. A case in point occurred earlier this year (2018) when a Japanese-built Brother R650X1 30-taper, three-axis, vertical machining centre (VMC) with 650 x 400 x 305 mm travels and twin pallet changer (2APC) was delivered by Whitehouse Machine Tools. It replaced an ageing, 40-taper VMC/2APC model with a similar working envelope and the benefits have been far-reaching. 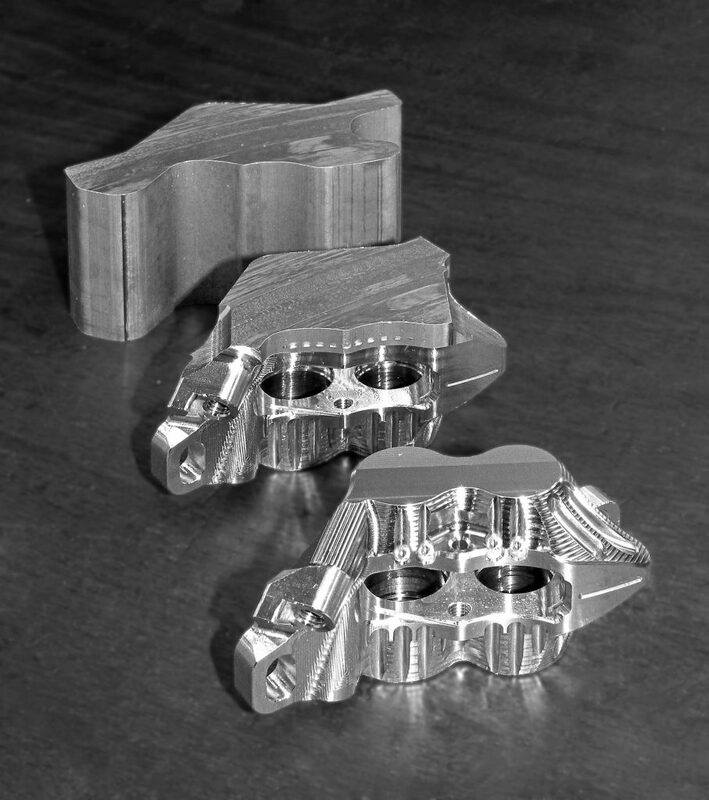 Hope’s twin-piston V4 brake caliper is produced in two operations from aluminium extrusion (background). 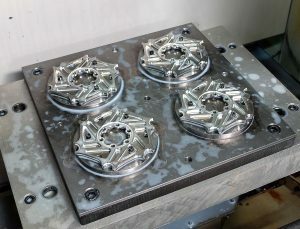 Shown centre is the part after Op1 on a 40-taper machining centre. Op 2, which has been completed on the component in the foreground on Hope Technology’s latest Brother R650X1, now takes 19 minutes for three parts compared to 32 minutes previously on a 40-taper machine – a 40 per cent time saving. First, the Brother machine is much more productive. For example, Op 2 on three twin-piston brake calipers fixtured side-by-side now takes 19 minutes whereas it previously took 32 minutes, representing a 40 per cent reduction. Time savings of this order are typical across the expanding range of parts being transferred across to the more agile machine. Secondly, the footprint occupied by the R650X1 is 20 per cent smaller, which is helpful in a busy factory requiring more and more machine tools to service a business whose recent annual percentage turnover growth is well into double digits. 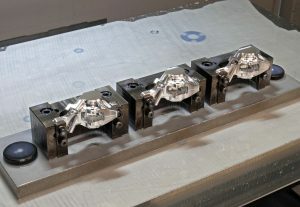 A single-piston brake caliper with Op 1 already completed fixtured three at a time on one pallet of Hope Technology’s latest Brother R650X1 machining centre. The single-piston brake calipers after Op2 on the R650X1. The cycle time is just 11 minutes for all three. A third advantage is that, as any 30-taper machining centre draws less power than a 40-taper machine with equivalent working envelope, there is an ongoing reduction in energy consumption that not only saves money but is also appropriate in a company that makes equipment for carbon-free transportation. 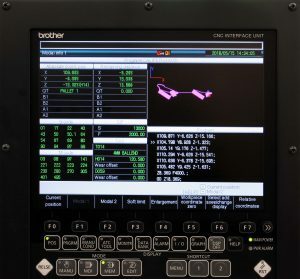 The R650X1 additionally provides power regeneration from spindle deceleration, while the Brother CNC-C00 control minimises the power consumed by motors, pumps and lights by putting them into standby when not in use. Lindley Pate, works and production manager at Hope Technology, inspecting brake calipers on which the second operation has been performed efficiently on the Brother R650X1 machining centre seen in the background. Mr Pate explained, “We use ten 30-taper machining centres on our production floor and fifteen prismatic metalcutting machines with 40-taper spindles, a mix of VMCs and horizontal-spindle machines. Half of the 40-taper machines are in multi-pallet cells and that will not change; in fact at MACH 2018 I ordered another 5-axis model equipped with a 32-pallet pool. 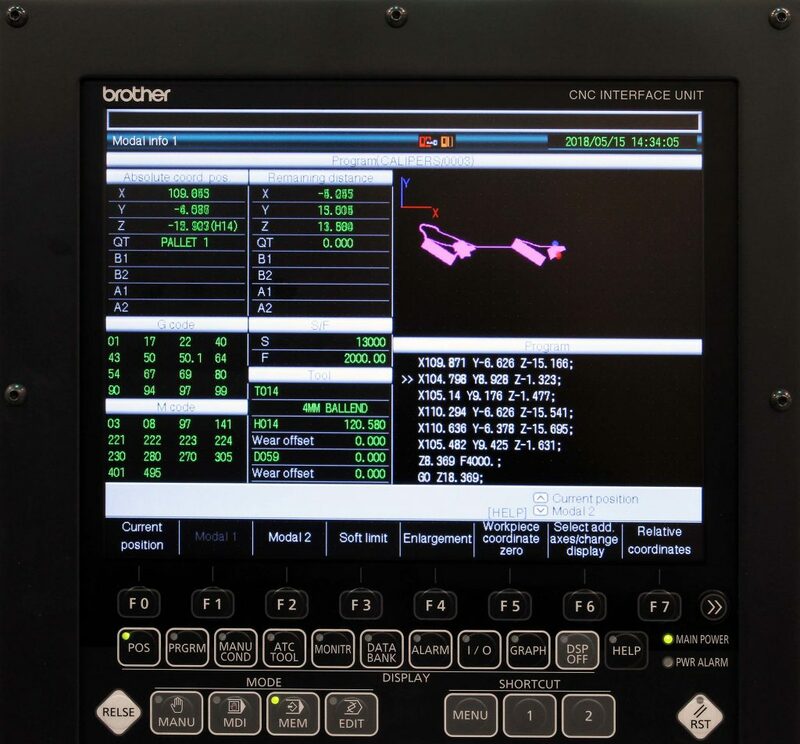 “Where there is scope for swapping to 30-taper is in respect of our single-table and stand-alone 2APC 40-taper machines. The benefits are compelling due to the higher output that is possible using the smaller tool interface, while accuracy and repeatability are just as good. He points to the use of a BIG Plus spindle on the latest R650X1, which provides face-and-taper contact with the tool’s back end, leading to extreme rigidity. It allows, for instance, a 32 mm diameter face mill to skim components to achieve a fine finish on some surfaces, cosmetic features that are much appreciated by customers in more than 40 countries that use Hope’s high-end bicycle parts. 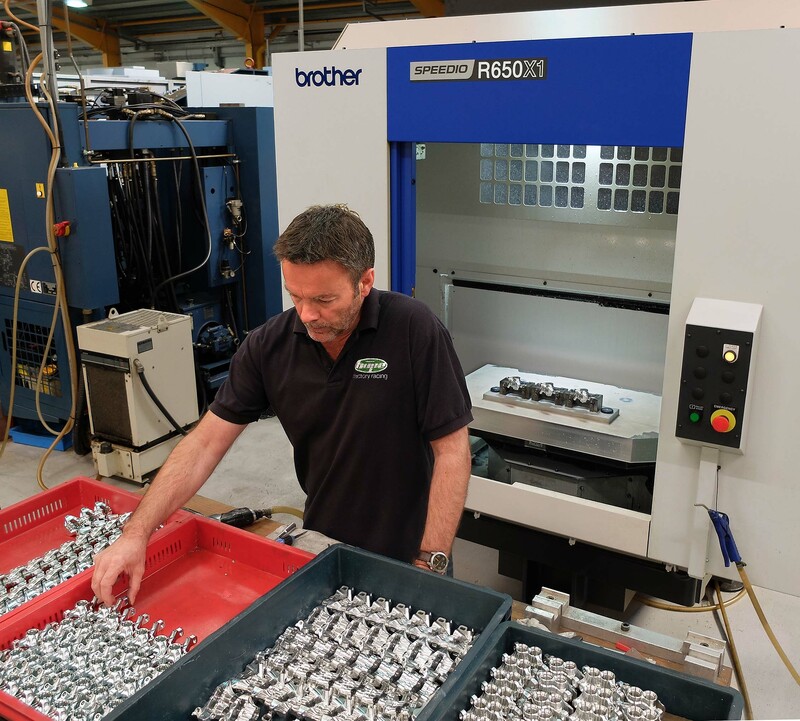 The manufacturer’s first encounter with Kenilworth-based Brother agent Whitehouse Machine Tools was five years ago when two 30-taper TC-2RB 3-axis machining centres were purchased to cope with increased workload. At the time Hope used, and still does, six 30-taper machining centres of a different make, some equipped with manual pallet change. Disc brake centres being fixtured four at a time for Op2 on a Brother TC-R2B at Hope Technology. Close-up of the disc centres after Op1 has been performed on four laser-cut blanks. The original laser-cut blank (foreground), completion of Op 1 (centre) and the final disc centre after Op 2 (right). Brother TC-2RB machines were selected owing to their superior speed and hence productivity and also due to the compact design of the automatic pallet changer that both increases production efficiency and saves space. Brother calls this a QT (quick turn) table, which is essentially one large pallet rotating around its centre, so no time is lost by having to temporarily disengage pallets for 180-degree indexing into and out of the machine’s working area. Two years ago, the first R650X1 arrived on the shop floor at Barnoldswick, again to cope with steeply increasing demand for Hope bicycle accessories. The machine was considerably faster in-cut than the TC-R2Bs, as well as offering similarly short idle times. It also provided a larger table, 800 x 600 mm instead of 600 x 300 mm, and at a competitive price. 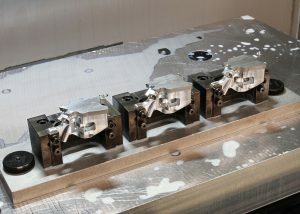 The extra table area enables more parts to be fixtured for longer run times, which is especially useful for lights-out machining during 24-hour operation, currently from Monday through to Thursday. A single shift is operated on Friday and weekend working is according to demand. 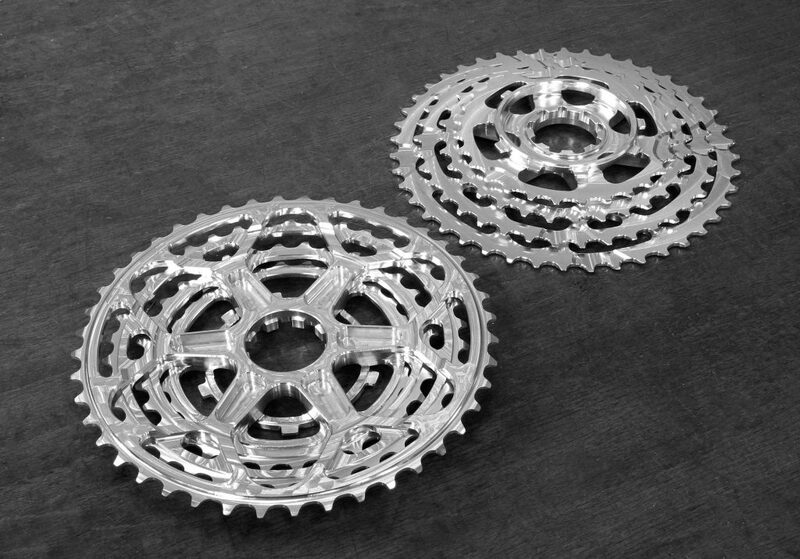 The two sides of a Hope rear cassette, which provides the four lowest gear ratios. It is milled two at a time from round billets in two operations on the first Brother R650X1 machining centre to be installed at Hope Technology. Further benefits of the R650X1 are the option of 22-tool storage capacity rather than 14 positions on the TC-R2B, 15 bar coolant delivery through the 16,000 rpm spindle, and notably 30 m/min cutting feed rate in all axes instead of 10 m/min in X and Y and 20 m/min in Z on the TC-R2B. 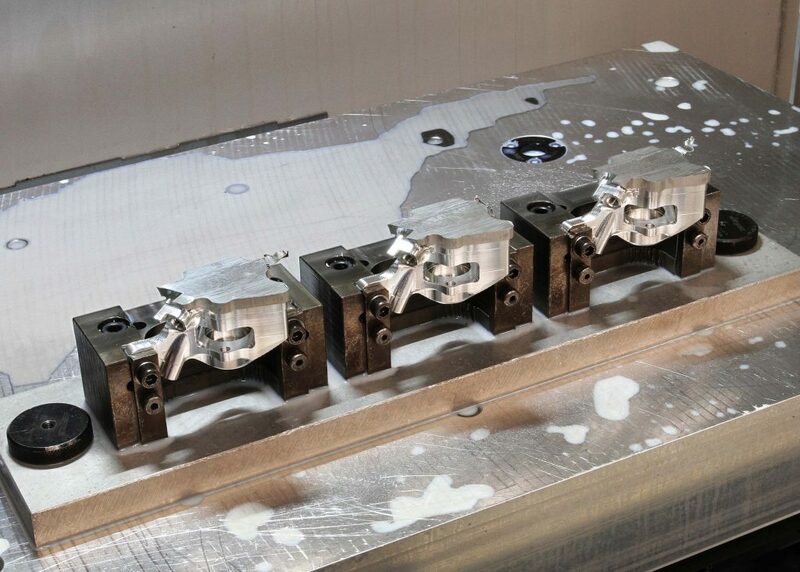 The inherent speed of all Brother machining centres derives from fast tool changes and APC time as well as 50 m/m rapids, all of which happen at the same time so that the tool is in position to cut the next part instantaneously after pallet changeover. 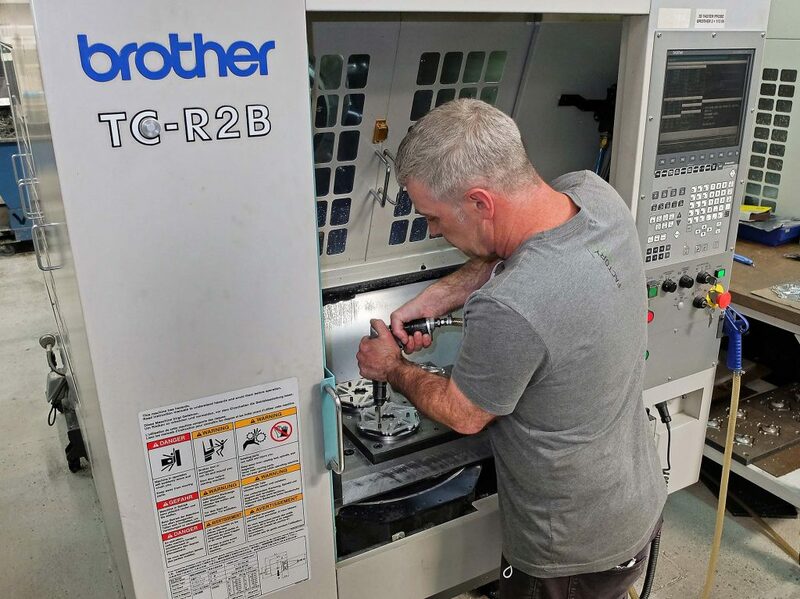 The powerful Brother CNC-C00 control allows high-speed, high precision contour milling and has sufficient memory for two different, complex components to be produced on the R650X1’s pallets. Larger memory capacity in the Brother control is useful, as two dissimilar Hope parts can be fixtured and machined on the R650X1’s pallets. In contrast, on the old 40-taper machine, a relatively complex part had to be machined two at a time due to lack of control memory. The ability to produce different parts on one machine is useful to Mr Pate, who sees part numbers for machining new component derivatives arriving all the time from the design office but very few being deleted. In conclusion, Mr Pate commented, “There is a greater variety of 30-taper milling centres around now and more tooling is available to use on them. They are extremely compact, helped by the carousel style of tool magazine.